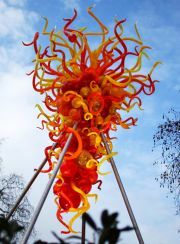 A new masterpiece from world-famous glass artist Dale Chihuly has been unveiled in London to commemorate the 2012 Olympic Games. The large and impressive sculpture is named “Torchlight Chandelier” and exhibits many of Chihuly’s dazzling and distinctive design elements which he is so well known for incorporating into his works. This incredible work of art stands nearly 20 feet tall is comprised of 350 separate glass pieces. The individual glass pieces are formed into a variety of organic shapes – a signature of many Chihuly pieces. It is brilliantly lighted each night and is quite beautiful to view at night against the London skyline. The sculpture will remain installed until the end of the 2012 Olympics. Seattle based artist Dale Chihuly is renowned worldwide as one of the most innovative and exciting artists working with blown glass. His impressively large art glass installations have been displayed in numerous galleries and museums around the world to great acclaim. He is widely credited with revitalizing the art of glassmaking. Browse the wonderful selection of Dale Chihuly’s blown glass sculptures, bowls and baskets for sale on eBay. You won’t find a more impressive selection anywhere else!